Eric Masterson never expected to be promoted from cyclist to an executive position in his friend Sawyer Mancini’s successful pedicab business. His new job includes scouting out locations in Indianapolis and introduces him to many people with inspiring stories. One of the more fascinating individuals is beautiful Grace Warner, the owner of a downtown art gallery. She demonstrates compassion for those with disabilities, interprets for the deaf in her church, and seems willing to help everyone else. So why won’t she give him the time of day? 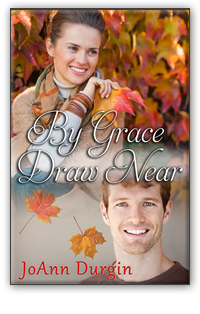 By Grace Draw Near, a contemporary Christian romance celebrating love, community, faith, and God’s abundant grace.